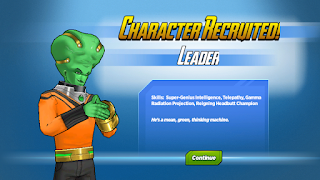 The Leader was a new character who you could recruit during the Legends Assemble! Special Event 2017. Scientist Supreme: You'll regret betraying me, Leader. The Leader: I once at a gallon of double chocolate chuck in three minutes, triggering intense dysentery and an ice cream migraine that lasted forty-eight days. You know nothing of regret. The Leader: Before you pummel me with indestructible fists and poorly constructed sentences, please allow me to apologize. Hulk: You blew up Hulk's desert man cave. The Leader: I know. I'm sorry. Ever since my gamma accident, I've defined my life by being your enemy. I was jealous of the power you were given, and the love you receive. I was wrong to hate you for my own insecurities. The Leader: I want to change. To be better. I want to help people instead of hurting. I want to work with super-geniuses instead of conspiring against them. I want to be an Avenger. I want to be your friend, Hulk. Hulk: Hulk's eyes not get this watery since he accidentally ate grenade. M.O.D.O.K. : M.O.D.O.K. 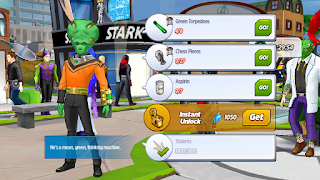 's friends are gathering everything you need to join Avengers Academy. The Leader: Excellent. When I have my supplies, I will be more than happy to help you get revenge against Scientist Supreme. M.O.D.O.K. : M.O.D.O.K. lied. M.O.D.O.K. doesn't have friends. M.O.D.O.K. will gather your supplies himself with his delicate arms, and ineffectual legs. 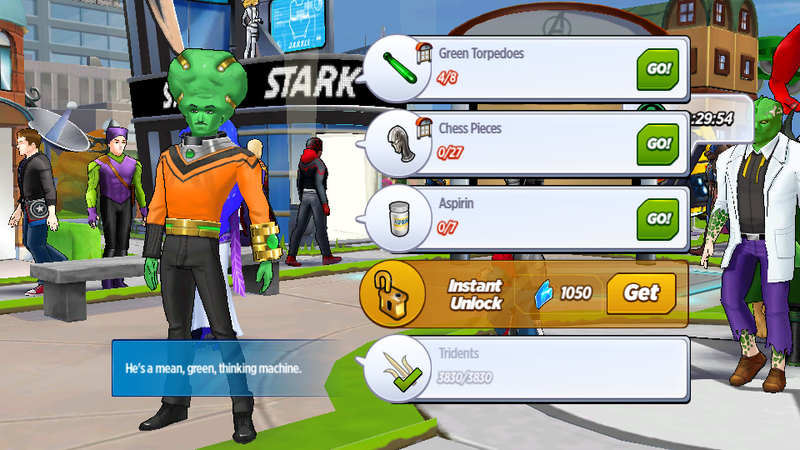 Pepper Potts: Welcome to Avengers Academy, Leader! We're so happy you aren't evil anymore, and can help teach our students advanced chemistry, and gamma radiation theory! The Leader: I'm happy to be in a place with so many established heroes, and renowned super-scientists. Pepper Potts: Can we get you anything special? The Leader: A huge pillow. That's not a joke. I really need that. The Leader: Director Fury has tasked me with developing a solution to the Academy's frequent invasion issue. M.O.D.O.K. : M.O.D.O.K. has run countless calculations in hopes of solving this problem, and using it as an ice-breaker to spark potential friendships, but to no avail. M.O.D.O.K. : M.O.D.O.K. can relate to your cranium-related problems! The Leader: I've invented a gamma brainray capable of turning simple creatures into a superhuman super-scientist like myself. An army of super-geniuses will allow us to fend off potential attacks before they ever occur. Loki: They're laughing at you, Peeper. The Leader: What are you talking about? Loki: The faculty is using you for your questionable intelligence. The students are accepting you out of the illogical kindness of their hearts. No one truly wants you here. Odin: We generally don't grow as a team by mocking one another. The Leader: A team? A team doesn't pretend to welcome someone, and then stab him in the back. Odin: What do you mean? Everyone wants you here, Leader. Your intelligence is valued, and providing villains with a chance at redemption is one of our core tenets. The Leader: Nice try, but Loki told me everything. Odin: Loki is the god of mirth. He was only joking. The Leader: It wasn't very funny. Odin: Loki's idea of a good joke is pushing someone down the stairs. I eventually had to have our palace stairs removed. Hulk: What you think Hulk thinks? Hulk: Hulk love giving fluids for science! The Leader: Thank you. I'm aware. Hulk: Leader should talk to Pym. Always making crazy things with crazy brain. Hank Pym: Leader! How are things going for our newest super-scientist?! The Leader: Reasonably well, but I could use your assistance with my latest experiment. Hank Pym: Is it a car that talks to you, guides you through any number of tricky situations, and can access secret information, all while being far sassier than the average car?! Hank Pym: Unfortunate! I think I pulled something hoping so hard! The Leader: It's a gamma ray capable of gifting the simplest creatures with my immense genius. Hank Pym: Let's attach it to a sassy car! Hank Pym: Fantastic! You should be happy! I'm always happy! There's an alternate version of me who is always itchy! He's never happy! The Leader: I realized that I can't use this new formula. She-Hulk: Oh geez, Leader. I like that you aren't evil anymore, but you really aren't my type. The Leader: I'm not asking you out. She-Hulk: Oh. Awesome. No offense. The Leader: Have you ever felt like someone is controlling your mind? She-Hulk: If someone had control of our minds, why would they let it go? The Leader: Maybe they didn't. Maybe they wanted to test if they did before moving onto the next gamma transformed superhuman? She-Hulk: Do you think someone is trying to create an army of Hulks? The Leader: It's possible. I tried to create an army of penguins. The Leader: Thank you for reverting to your original form. I could use the help of a fellow super-scientist. Bruce Banner Hulk: My pleasure. As long as this all isn't a trick to murder me in my weakened state. Bruce Banner Hulk: I think you're right, Leader. Someone has found a way to remotely manipulate our brains based on the chemical change caused by the gamma radiation. The Leader: It's my fault. Bruce Banner Hulk: You did this? The Leader: Do you remember being held captive by The Intelligencia? M.O.D.O.K. : Does M.O.D.O.K. ever! They kept him in a room with a bean bag AND windows! They really know how to treat a prisoner! The Leader: They constantly move their base to keep their location a secret. Do you think you can use your probability powers to estimate their current location? M.O.D.O.K. : M.O.D.O.K. can do anything for a friend! The Leader: I knew better than to trust a cabal of villainous scientists, but I was so desperate for acceptance and intelligent discourse. M.O.D.O.K. : Now you have M.O.D.O.K.! The Leader: They were secretly running experiments on me the entire time. Searching for a way to take control of the Hulks. M.O.D.O.K. : That makes M.O.D.O.K. so mad! She-Hulk: I better keep an eye on my cousin. 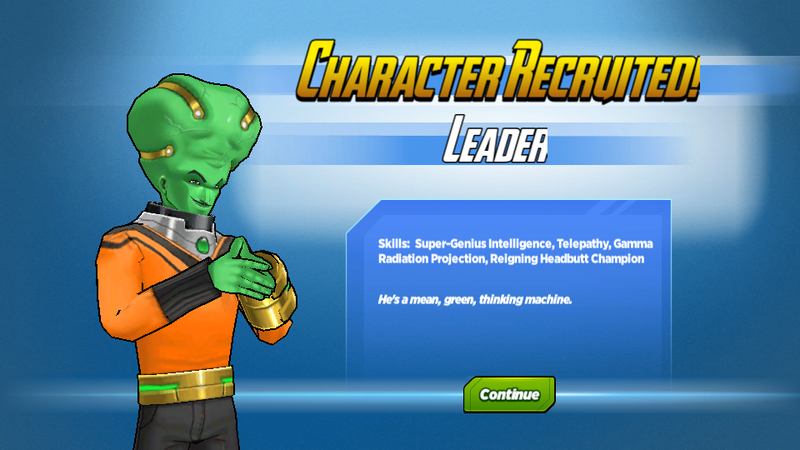 Amadeus Cho: We got this. Red Hulk: I guess I'll help you nerds. M.O.D.O.K. : Who was that masked man? The Leader: Someone we were lucky to escape even with an army of Hulks. At least we destroyed the ray that let them control our minds. The Leader: Am I doing it right?! What do you think of The Leader? Any favourite phrases or actions?